In data odierna la questura di Cagliari, tramite il commissariato di Iglesias, ha comunicato le prescrizioni per la manifestazione contro la fabbrica delle bombe RWM S.p.A. a Domusnovas. 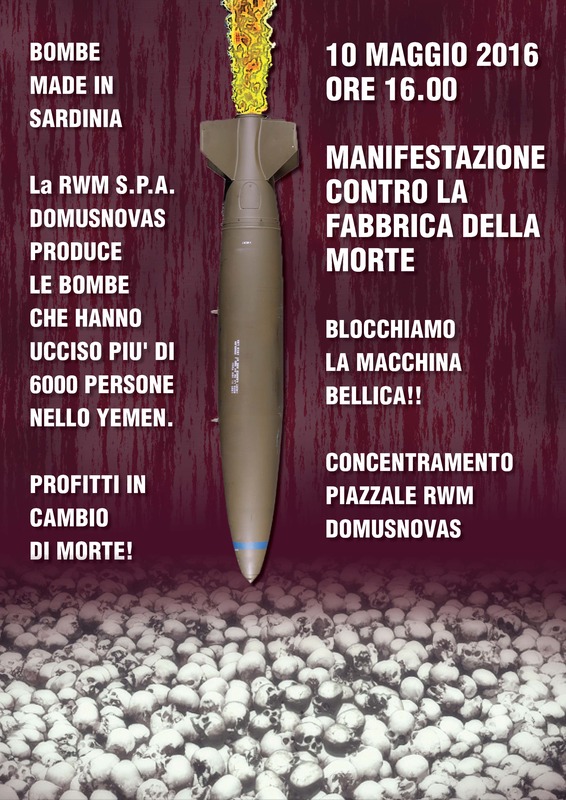 L’RWM, secondo le comunicazioni della questura, ha chiesto di vietare la manifestazione alle 16 invitando gli antimilitaristi a rimandare di un’ora il concentramento nel piazzale della fabbrica per non disturbare la produzione di bombe e arrivare dopo chiusura. 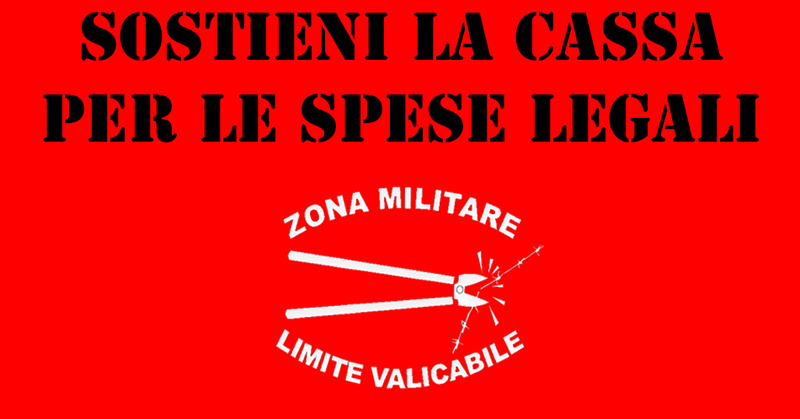 Gli antimilitaristi confermano l’orario della manifestazione, alle ore 16.00 e ribadiscono l’urgenza di interrompere la fabbricazione di ordigni bellici. Ma è noto che le guerre convengono esclusivamente a chi le fa e dai territori inguerra si può solo scappare per sopravvivere. L’unico scopo della Rheinmetall è chiaramente la crescita del suo fatturato. Non dimentichiamo infatti che questa società è la stessa industria che ha dovuto cambiare più volte nel corso della storia, nome, sede e tipo di produzione: dopo la prima guerra mondiale e dopo aver servito la Wehrmacht nazista ma è sempre resuscitata con una nuova patina, assetata di soldi e senza scrupoli. On May 10, shareholders of the largest German war industry, meet in Berlin for their general assembly. RWM S.p.A. is one of the German giant’s many subsidiaries around the world. Rheinmetall AG’s turnover for 2015 was 2.6 billion euros. The defense sector of Rheinmetall is responsible for about half of the group’s sales, which means that this money comes from the sale of guns, ammunition, electronic systems, tanks and other weaponry. Some examples include: An order of tanks in Algeria, built directly on the spot; Leopard 2 tanks sold in Indonesia; the 250,000 MK bombs delivered last June through the RWM to the UAE, responsible for the ongoing massacre in Yemen. But it is known that wars only benefit those who wage them and in war one can only escape to survive. The sole purpose of Rheinmetall is clearly the growth of its turnover. Do not forget that this company is the same industry that has had to change name several times throughout its history, name, location and type of production: after the First World War and after having served the Nazi Wehrmacht, but it is always revived with a new patina, unscrupulous and thirsty for money. We know perfectly well that the multinationals make the best investments in countries with economic difficulties, not least in Sardinia, where work has never been an opportunity, but a form of blackmail. This period of permanent conflict, which for some means only business, promises an expansion of RWM in Sardinia, thanks to other orders and in view of new wars such as the one in Libya. We firmly believe that to thrive on the life and death of people can not be a job, whether you are screwing a bolt or closing a major contract. The possibility of losing some jobs in an economically and socially devastated land creates anxiety, we can understand that, but not accept it. We do not want to be blind, or slaves, we must find a way to free ourselves from the idea that paying for a thirty-year mortgage requires one to be part of a mechanism that fattens the interests of an economic policy founded on war. 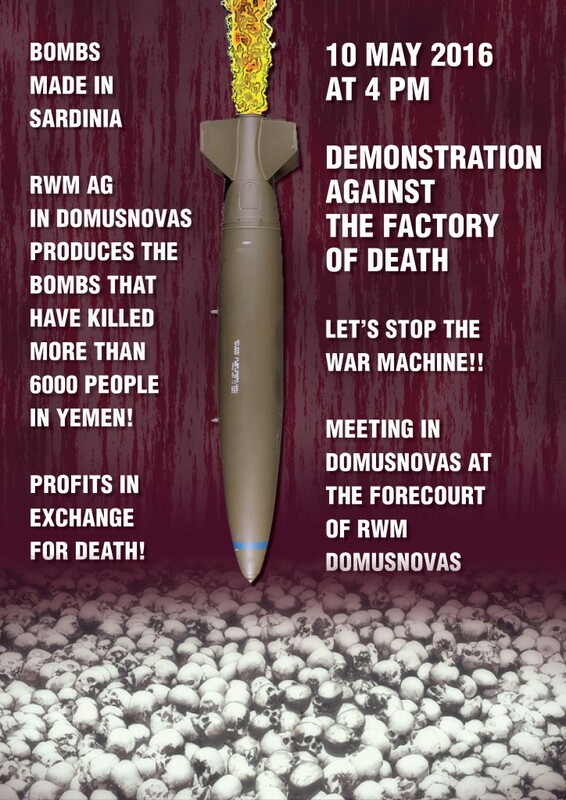 For these reasons we are meeting on May 10 in front of the forecourt of the Domusnovas factory in conjunction with the protests of the German anti-militarists in Germany who, in Berlin, will protest in front of the headquarters of the General Assembly of shareholders. Stop those who so nonchalantly produce, transport and deliver products of death using our streets, our ports and our airports!